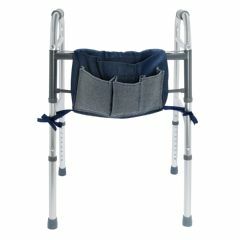 Allegro Medical presents the DMI Universal Walker Pouch. This handy DMI® Walker Pouch attaches to the front of your walker and gives you four convenient pockets to carry the things you use the most. Whether you are using it around the house or outside, you will have your important items right in front of you, leaving your hands free as you walk. The smaller pockets are great for holding a water bottle, travel mug, phone, eyeglasses, notepad, pen, snacks, etc. The large pocket can hold a tablet, newspaper, magazine or book. The pouch is made from durable navy denim. This convenient walker storage pouch attaches easily to the front of your walker, allowing you easy access to the things you use most often. Four storage pockets (three small and one large) allow you to carry multiple items. Security straps prevent the bag from swinging. Pouch is easily removable and machine washable; size 9.5 x 13 inches.